Please Note: Strict Limit of 1 (One) Cartridge per Collector. One Cartridge: 5mm Clement Auto by Keller & Company of Hirtenburg, Austria. Factory loaded before 1934: brass case with “ H * K & C *” Head-Stamp and a nickel plated, non-magnetic FMJ ( Full Metal Jacket) projectile. Excellent condition, minor spots. Sold as collectible may not fire , no returns if primer if dented trying to fire. Please Note: Strict Limit of 1 (One) Cartridges per Collector. Please Note: More below in related products, also Clips for firearm. 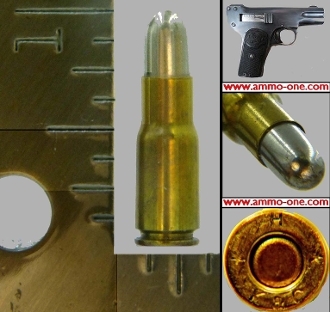 History 5mm Clement Auto cartridge: The 5mm Clement cartridge developed and introduced in Spain in 1897 for the Charola Y Antiua” semi-automatic pistol. It was adopted in Belgium around 1903 for use in the Charles P. Clement semi automatic pistol, until the pistol chambered in the 5mm Clement was no longer produced in 1908. Manufacture of the 5mm Clement cartridge by a few manufacturers continued until the early 1930s, making this calibers obsolete for at least 85 years or more at this writing, Feb, 13th. 2017.